Road-Rail vehicle UniRoller 4×4 is universal Road-Rail vehicle, which can be equipped with various superstructures – loading platform, hydraulic loading crane, water sprinkler, sprayer, mobile workshop, rescue vehicle equipped with rerailing equipment, working platform, etc. 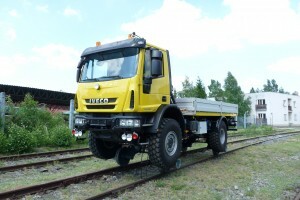 Vehicle can be equipped with frame for quick exchange of superstructures using stabilizers. 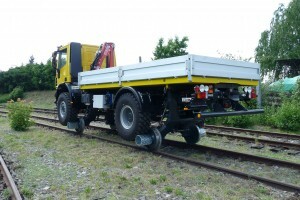 UniRoller 4×4 can be quickly on and off-tracked for maintenance work on and off railway tracks, with various superstructures and low operation and service costs. Power transmission during ride on rails is enabled by vehicle tyres by means of drums. Road tyres are not in contact with rails (basically equipped) for reasonable price. 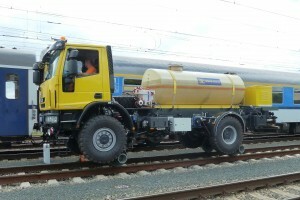 Both rail gears are equipped with two wheels and are installed behind road axles. Vehicle can be equipped with CCTV system for safe reverse ride, as well as railway lights and illumination for work at night. All operations on rails are controlled electrically from driver’s cab or from vehicle sides. Reversible gearbox enables ride at the same speed in both directions.